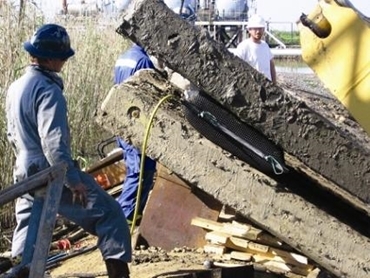 A versatile lifting bag from Enerpac (A Division of Actuant Corp) was used by a contracting company to shift heavy rocks during clean-up and reconstruction after the Christchurch earthquake. Enerpac’s lifting bag is typically used in Australasia to position everything from pipelines to machinery at worksites. The lifting bag was used by Geotech ground engineering contractors to dislodge potentially dangerous boulders that had been loosened during the February earthquake and posed a risk to the roadway below. Geotech specialises in ground stabilisation and tunnelling, with the ability to work in extreme environments. Garry Millar, managing director of Enerpac distributor Gino Hydraulics offered the lifting bag to Geotech as a solution to replace the cumbersome big lever crowbars and jacks used by their workers to clear the loose rocks. Gino Hydraulics supplied Geotech with an Enerpac LB-14 lifting bag featuring a 11.7 tonne or 126 kN lifting capacity. The lifting bag weighed just 5.5kg and could be easily swung down the hill into position. Geotech powered the lifting bag with a 100 psi air compressor running off a diesel generator. The bag was deflated, positioned behind the boulder to be moved and then inflated, dislodging the boulder from its surrounding earth. According to Nigel Gualter, general manager of Geotech, the airbag was very light and easy to handle, and its narrow profile allowed them to address any boulder where there was a gap wider than 28mm. The lifting bag was simply pushed into the crevice and inflated to move the rock. The high safety factor was also a key consideration since the lifting bag allowed the company to keep their workers away from the fall zone. Mr Gualter says that the airbag has now become an essential part of Geotech’s kit. Enerpac offers nine sizes of low clearance lifting bags along with their controls for lifting, pushing, pressing or moving loads safely and smoothly. The bags use compressed air up to 116 psi (8 bar) or water to achieve load capacities ranging from 3.1 ton to 67.2 ton. The uniquely designed Kevlar-reinforced lifting bags feature a high friction surface to provide increased safety for applications in construction, earthmoving, engineering, manufacturing, mining and energy, quarrying, oil and gas, primary production, heavy transport and machinery, marine, maintenance, materials handling and safety sectors. Enerpac lifting bags complement Enerpac’s comprehensive range of high-pressure (700 bar) hydraulic lifting equipment as well as a line of plastic cribbing blocks and wedges that optimise safety when stabilising heavy loads after they have been lifted.